Change is the only constant. This post comes in a time of uncertainty – the American elections are ongoing and the winner of the race will be announced next week. Whether Trump or Clinton becomes the next president it is almost certain the world will change. Here in South East Asia we feel the rumbling pains of economic slowdown. Closer to home for me, my workplace leaders are changing and even my own job scope has changed and is still morphing. It’s been a month since I shifted into my part time role at work. The first month I compartmentalized as a transition month and was very attentive to making sure that I had time to rest, plenty of solitude and meditation time and more time for family. There were one or two unpleasant moments, like when an office administrator who forgot I had shifted to part time work, called me up and asked why I was not at work as there was no leave application on her records. That aside, most people have tried to respect my time away, but unfortunately I also have patients who don’t understand that concept and have been snarky when I’ve told them I can’t see them on any day of the week they want. Still all these experiences are just teaching me to say “no” more decisively and to keep to the boundaries that I have drawn. It’s just something I’m learning and I still have a ways more to go. Compounding the issues of change, on the home front kid#1 and kid#2 are having national level exams. Kid#1 is taking his A levels and kid#2 will be doing her O level Chinese exam. I confess I feel a little helpless as I have been unable to support kid#1 who is doing mainly arts type subjects (and I did triple science as a student) and for sure I can’t help kid#2 in her Chinese exams as she knows way more than me. It doesn’t quite stop me from feeling guilty/anxious because I am, after all, a Singapore mum and in the end I will be inundated by all my relatives’ and friends’ questions about how my kids did in their exams. Still I have been mulling about my parenting style. I’m often the mother who discovers on Sunday that the kids exams are happening on Monday – and will usually tell them “quick, quick go and study”. But this year that didn’t happen of course as the big exams were looming. I think because I grew up in a home where I had minimal tuition except for Chinese (which we all struggled with), I always felt that the kids should navigate their own learning needs and learn to manage their own time and priorities. And I’ve also felt that the best thing I can do as a parent is to let my kids learn from failure. This was hard because my natural instinct is to protect them and prevent bad things from happening to them. I’ve always wondered how the mother eagle feels kicking the eaglets out of the nest. Funnily enough there is a kind of role reversal between hubs and I – he arranges tuition for the kids and their programs, and I just pat them on the head when the report card comes back. And he worries a lot more about the kids’ exams than I do. Anyway some might be asking since I’m working part time and I don’t really sit on the kids for their studies, then what exactly do I do? Well this past month hasn’t been exactly that free as I had a trip to Pekanbaru for a women leaders’ retreat. That didn’t feel like work to me but did take up quite some time to prepare for. And there has been quite a lot of background work too, preparing for the Women’s Breakthrough Weekend for December. So there has been a bit more church ministry work but perhaps a little more balance in my life so that I’m not juggling work and ministry commitments and having 14-15 hour days for 7 days a week. So it’s been good so far, but I am always conscious of the need to create space and balance when both work and ministry demands rise. I did think that going part time I would be cooking a lot more but surprisingly this has been happening less than I thought. In the end I am still really grateful for the gadgets I have to make cooking faster and easier. So the Instant Pot has still seen a fair amount of use. Recently I made a rather spicy pulled beef recipe, which surprisingly was not rejected by the spice-averse kids. But as a reward for their long suffering, I decided to make a non-spicy pulled pork instead. 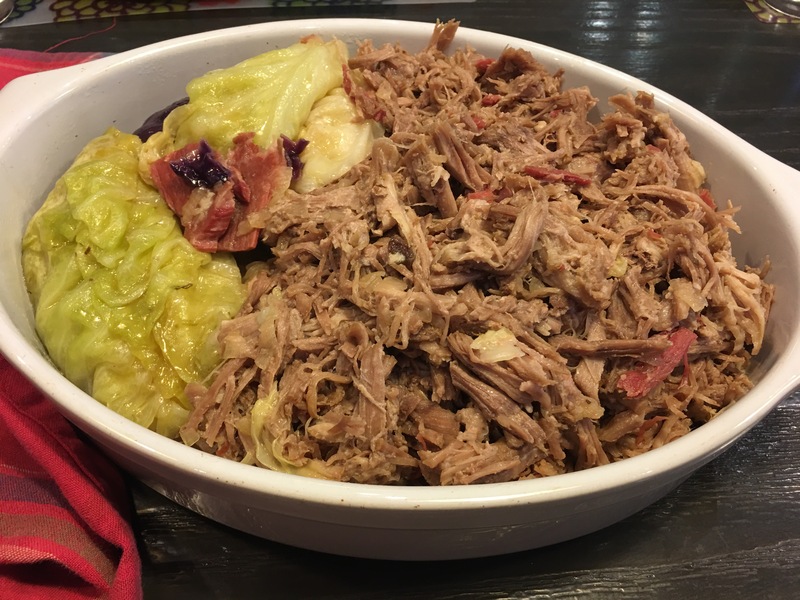 This pulled pork recipe is simple, flavorful, cheap and easy: the pork collar only cost me $12 at the Foodie Market Place and the rest of the ingredients are also easily accessible. 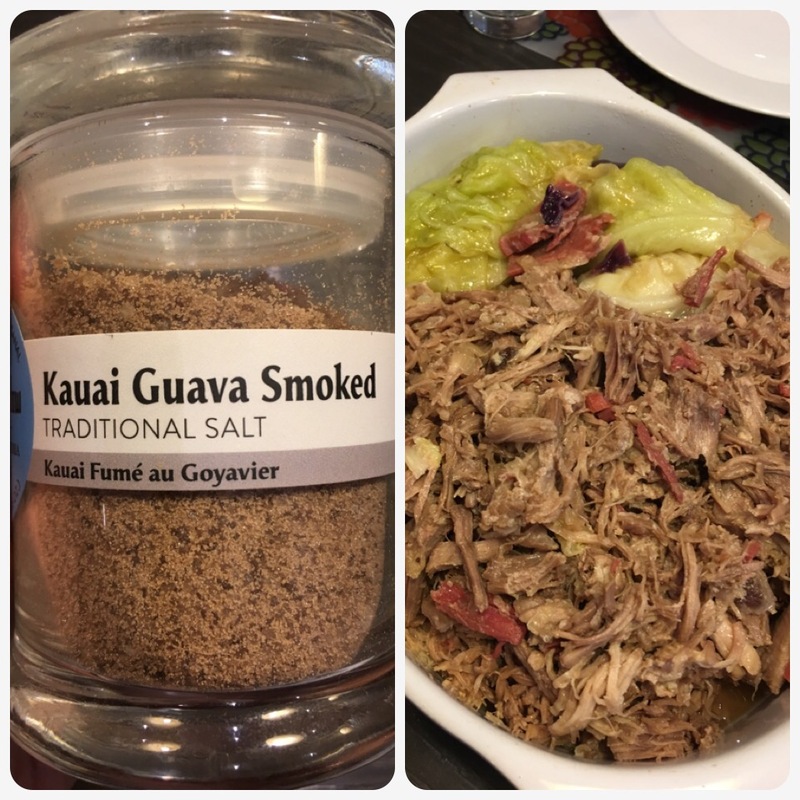 The smoked salt I used was a Hawaiian smoked guava salt that a friend brought back for me from Hawaii – I thought this was a great place to use it as there were some tangy and fruity overtones in the salt. This is a great recipe for a potluck or a crowd. Cut the pork collar in 3-4 large pieces. Cut small slits in the pork, and insert the cloves of garlic. Sprinkle the smoked salt generously over the pork pieces. Turn the sauté function on for the instant pot. Heat up the olive oil. Sear the pork pieces on all sides (about 10 min) and set aside. Sauté the bacon and onions. Put the pork pieces on top and add the water and lemon juice. Turn off the sauté function and close the lid of the pot, putting the valve into the sealed position. Turn on the high pressure manual tab and adjust time to 45 minutes. Pressure cook and allow natural pressure release for 10 min, then release the valve. Open the pot and remove the pork pieces and with a large spoon and fork, shred the pork. Place the cabbage into the gravy and close the pot again and pressure cook for 4-5 minutes. Place the pork into a serving platter and lay the cabbage on the side. Spoon over several spoons of gravy over the pork. Serve hot with some butterhead lettuce leaves to make lettuce cups.